"The Holy Great Prince Vladimir, Equal of the Apostles. Few names in the annals of history can compare in significance with the name of St Vladimir, the Baptizer of Rus, who stands at the beginning of the spiritual destiny of the Russian Church and the Russian Orthodox people. Vladimir was the grandson of St Olga, and he was the son of Svyatoslav (+ 972). His mother, Malusha (+ 1001) was the daughter of Malk Liubechanin, whom historians identify with Mal, prince of the Drevlyani. 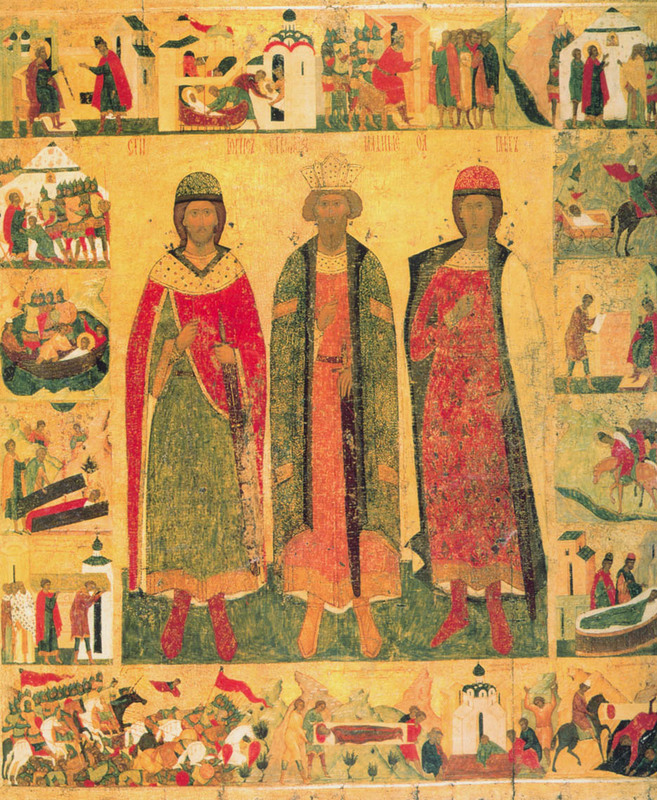 Having subdued an uprising of the Drevlyani and conquered their cities, Princess Olga gave orders to execute Prince Mal for his attempt to marry her after he murdered her husband Igor, and she took to herself Mal's children, Dobrynya and Malusha. Dobrynya grew up to be a valiant brave warrior, endowed with a mind for state affairs, and he was later on an excellent help to his nephew Vladimir in matters of military and state administration. The "capable girl" Malusha became a Christian (together with Great Princess Olga at Constantinople), but she preserved in herself a bit of the mysterious darkness of the pagan Drevlyani forests. Thus she fell in love with the austere warrior Svyatoslav, who against the will of his mother Olga made her his wife. The enraged Olga, regarding as unseemly the marriage of her "housekeeper" and captive servant to her son Svyatoslav, heir to the Great Kiev principality, sent Malusha away to her own native region not far from Vybut. And there in about the year 960 was born the boy with the Russian pagan name Volodimir, meaning peaceful ruler, ruling with a special talent for peace. In the year 970 Svyatoslav set out on a campaign from which he was fated not to return. He had divided the Russian Land among his three sons. At Kiev Yaropolk was prince; at Ovrucha, the center of the Drevlyani lands, was Oleg; at Novgorod was Vladimir. In his first years as prince, we see Vladimir as a fierce pagan. He headed a campaign, in which the whole of pagan Rus is sympathetic to him, against Yaropolk the Christian, or in any case, according to the chronicles, "having given great freedom to the Christians", on July 11, 978 he entered into Kiev, having become the "sole ruler" of the Kiev realm, "having subdued the surrounding lands, some by peaceful means, and the unsubmissive ones by the sword." Though Vladimir indulged himself in a wild, sensuous life, he was far from the libertine that they sometimes portray him as being. He "shepherded his land with truth, valor and reason", as a good and diligent master, of necessity he extended and defended its boundaries by force of arms, and in returning from military campaigns, he made for his companions and for all Kiev liberal and merry feasts. But the Lord prepared him for another task. Where sin increases, there, in the words of the Apostle, grace abounds (Rom. 5: 20). "And upon him came visitation of the Most High, and the All-Merciful eye of the Good God gazed upon him, and shone forth the thought in his heart, of understanding the vanity of idolous delusion, and of appealing to the One God, Creator of all things both visible and invisible." The matter of accepting Baptism was facilitated through external circumstances. The Byzantine Empire was in upheaval under the blows of the mutinous regiments of Bardas Skliros and Bardas Phocas, each of whom sought to gain the imperial throne. In these difficult circumstances the emperors, the coregent brothers Basil the Bulgar-Slayer and Constantine, turned for help to Vladimir. Events unfolded quickly. In August 987 Bardas Phocas proclaimed himself Emperor and moved against Constantinople, and in autumn of that same year the emissaries of Emperor Basil were at Kiev. "And having exhausted his (Basil's) wealth, it compelled him to enter into an alliance with the Emperor of the Russians. They were his enemies, but he besought their help," writes one of the Arab chronicles of events in the 980s. "And the Emperor of the Russians consented to this, and made common cause with him." 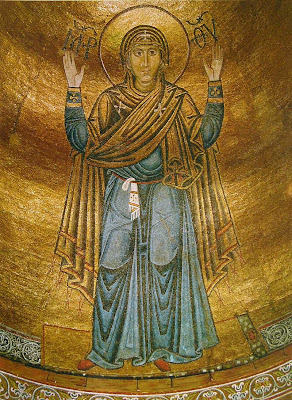 As a reward for his military help, Vladimir asked for the hand of the emperors' sister Anna, which for the Byzantines was an unheard of audacity. Princesses of the imperial lineage did not marry "barbarian" rulers, even if they were Christians. At the same time the emperor Otto the Great was seeking the hand of Anna for his son, and he was refused. However, in Vladimir's case Constantinople was obliged to consent. Vexed at the Greek duplicity, Prince Vladimir "hastened to collect his forces" and he moved "against Korsun, the Greek city," the ancient Chersonessos. The "impenetrable" rampart of the Byzantine realm on the Black Sea fell. It was one of the vitally important hubs of the economic and mercantile links of the empire. This blow was so much felt, that its echo resounded throughout all the regions of Byzantium. Vladimir again had the upper hand. His emissaries, the commanders Oleg and Sjbern soon arrived in Constantinople for the imperial daughter. Eight days passed in Anna's preparation, during which time her brothers consoled her, stressing the significance of the opportunity before her: to enable the enlightening of the Russian realm and its lands, and to make them forever friends of the Byzantine realm. At Taurida St Vladimir awaited her, and to his titles there was added a new one: Caesar (Tsar). The haughty rulers of Constantinople had to accede also in this, to bestow upon their new brother-in-law the imperial insignia. In certain of the Greek historians, St Vladimir is termed from these times as a "mighty basileios-king", he coins money in the Byzantine style and is depicted on it with the symbols of imperial might: in imperial attire, and on his head the imperial crown, and in his right hand the sceptre with cross. Together with the empress Anna, there arrived for the Russian See Metropolitan Michael ordained by holy Patriarch Nicholas II Chrysoberges. He came with his retinue and clergy, and many holy relics and other holy things. In ancient Chersonessos, where each stone brings to mind St Andrew the First-Called, there took place the marriage-crowning of St Vladimir and Blessed Anna, both reminiscent and likewise affirming the oneness of the Gospel of Christ in Rus and in Byzantium. Korsun, the "empress's dowry", was returned to Byzantium. In the spring of 988 the Great Prince and his wife set out through the Crimea, Taman and the Azov lands, which had come into the complexion of his vast realm on the return trip to Kiev. Leading the princely cortege with frequent Services of Thanksgiving and incessant priestly singing they carried crosses, icons and holy relics. It seemed, that the Ecumenical Holy Church was moving into the spacious Russian land, and renewed in the font of Baptism, Holy Rus came forth to meet Christ and His Church. Then followed an unforgettable and quite singular event in Russian history: the morning of the Baptism of the Kievans in the waters of the River Dneipr. On the evening before, St Vladimir declared throughout the city: "If anyone does not go into the river tomorrow, be they rich or poor, beggar or slave, that one shall be my enemy." The sacred wish of the holy Prince was fulfilled without a murmur: "all our land glorified Christ with the Father and the Holy Spirit at the same time." It is difficult to overestimate the deep spiritual transformation of the Russian people effected by the prayers of St Vladimir, in every aspect of its life and world-view. 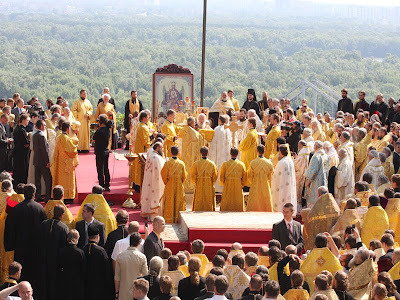 In the pure Kievan waters, as in a "bath of regeneration", there was realized a sacramental transfiguration of the Russian spiritual element, the spiritual birth of the nation, called by God to unforeseen deeds of Christian service to mankind. "Then did the darkness of the idols begin to lift from us, and the dawn of Orthodoxy appear, and the Sun of the Gospel illumined our land." In memory of this sacred event, the regeneration of Rus by water and the Spirit, the Russian Church established the custom of an annual church procession "to the water" on August 1. Later, the Feast of the Procession of the Honorable Wood of the Life-Creating Cross of the Lord, which Russia celebrated with the Greek Church, was combined with the Feast of the All-Merciful Savior and the Most Holy Theotokos (established by St Andrew Bogoliubsky in the year 1164). In this combination of feasts there is found a precise expression of the Russian theological consciousness, for which both Baptism and the Cross are inseparable. Everywhere throughout Holy Rus, from the ancient cities to the far outposts, St Vladimir gave orders to destroy the pagan sanctuaries, to flog the idols, and in their place to clear land in the hilly woods for churches, in which altars would be consecrated for the Bloodless Sacrifice. Churches of God grew up along the face of the earth, at high elevated places, and at the bends of the rivers, along the ancient trail "from the Variangians to the Greeks" figuratively as road signs and lamps of national holiness. Concerning the famed church-building activity of St Vladimir, the Metropolitan of Kiev St Hilarion (author of the "Word on Law and Grace") exclaimed: "They demolished the pagan temples, and built up churches, they destroyed the idols and produced holy icons, the demons have fled, and the Cross has sanctified the cities." From the early centuries of Christianity it was the custom to raise up churches upon the ruins of pagan sanctuaries or upon the blood of the holy martyrs. 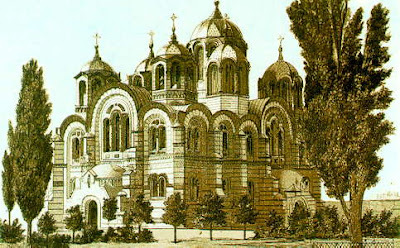 Following this practice, St Vladimir built the church of St Basil the Great upon a hill, where a sanctuary of Perun had been located, and he built the stone church of the Dormition of the Most Holy Theotokos (Desyatinnaya) on the place of the martyrdom of the holy Varangian Martyrs (July 12). The magnificent temple was intended to become the cathedral for the Metropolitan of Kiev and All Rus, and thus the primal altar of the Russian Church. It was built in five years, and was richly adorned with frescoes, crosses, icons and sacred vessels, brought from Korsun. The day of the consecration of the church of the Most Holy Theotokos, May 12 (in some manuscripts May 11), was ordered by St Vladimir to be inserted into the Church calendar as an annual celebration. This event was linked with other events celebrated on May 11, and it provided the new Church a twofold sense of continuity. Under this day in the calendar is noted the churchly Founding of Constantinople "dedicated by the holy emperor St Constantine as the new capital of the Roman Empire, the city of Constantine is dedicated to the Most Holy Theotokos (330). On this same day of May 11, the church of Sophia, the Wisdom of God was consecrated at Kiev (in the year 960 under St Olga). St Vladimir, having had the cathedral church consecrated to the Most Holy Theotokos, followed the example of St Constantine in dedicating the capital city of the Russian Land (Kiev) to the Queen of Heaven. Then a tithe or tenth was bestown on the Church; and since this church had become the center of the All-Russian collection of churchly tithes, they called it the Tithe church. The most ancient text of the grant, or church rule by holy Prince Vladimir spoke thus: "For I do bestow on this church of the Holy Mother of God a tenth of all my principality, and also throughout all the Russian Land from all the princely jurisdiction a tithe of squirrel-pelts, and from the merchant, a tithe of the week, and from households each year, a tenth of every herd and every livelihood, to the wondrous Mother of God and the wondrous Savior." The grant also specified "church people" as being free from the jurisdictional power of the prince and his "tiuni" (officials) and placed them under the jurisdiction of the Metropolitan. The chronicle has preserved a prayer of St Vladimir, with which he turned to the Almighty at the consecration of the Dormition Tithe church: "O Lord God, look down from Heaven and behold, and visit Your vineyard, which Your right hand has planted. And make this new people, whom You have converted in heart and mind to know You, the True God. And look down upon this Your church, which Your unworthy servant has built in the name of the Mother Who gave birth to Thee, the Ever-Virgin Theotokos. And whoever prays in this church, let his prayer be heard, through the prayers of the All-Pure Mother of God." With the Tithe church and Bishop Anastasius, certain historians have made a connection with the beginnings of Russian chronicle writing. 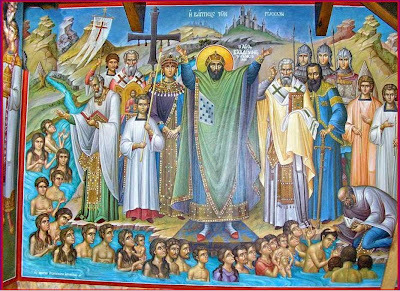 At it were compiled the Life of St Olga and the account of the Varangian Martyrs in their original form, and likewise the "Account, How in the Taking of Korsun, Vladimir came to be Baptized." Here also originated the early Greek redaction of the Lives of the Holy Martyrs Boris and Gleb. During the time of St Vladimir, the Kiev Metropolitan See was occupied successively by the Metropolitan St Michael (September 30), Metropolitan Theophylactus, who transferred to Kiev from the See of Armenian Sebaste (991-997), Metropolitan Leontius (997-1008), and Metropolitan John I (1008-1037). Through their efforts the first dioceses of the Russian Church were opened: at Novgorod (its first representative was St Joachim of Korsun (+ 1030), compiler of the Joachimov Chronicle), Vladimir-Volyn (opened May 11, 992), Chernigov, Pereslavl, Belgorod, and Rostov. "And thus throughout all the cities and villages there were set up churches and monasteries, and the clergy increased, and the Orthodox Faith blossomed forth and shone like the sun." To advance the Faith among the newly enlightened people, learned people and schools were needed to help prepare them. Therefore, St Vladimir and the holy Metropolitan Michael "commanded fathers and mothers to take their young children and send them to schools to learn reading and writing." St Joachim of Korsun set up such a school at Novgorod, and they did the same in other cities. "And there were a multitude of schools of scholars, and of these were there a multitude of philosophers." With a firm hand St Vladimir held in check enemies at the frontiers, and he built fortified cities. He was the first in Russian history to set up a "notched boundary," a line of defensive points against nomadic peoples. "Volodimir began to set up cities along the Desna, along the Vystra, along the Trubezha, along the Sula and along the Stugna. And he settled them with the Novgorodians, the Smolyani, the Chuds and the Vyatichi. He made war against the Pechenegs and defeated them." But the real reason for his success was the peaceful Christian preaching among the pagans of the steppes. 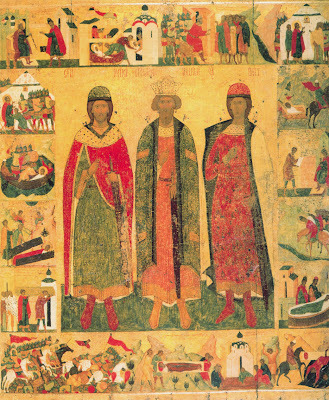 In the Nikol'sk Chronicles under the year 990 was written: "And in that same year there came to Volodimir at Kiev four princes from the Bulgars and they were illumined with Divine Baptism." 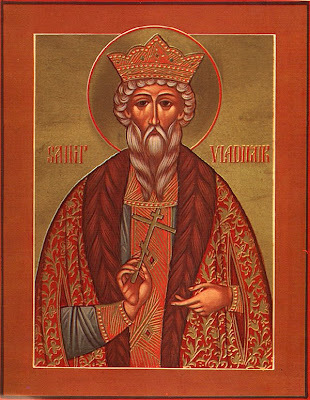 In the following year "the Pecheneg prince Kuchug came and accepted the Greek faith, and he was baptized in the Name of the Father and of the Son and of the Holy Spirit, and served Vladimir with a pure heart." Under the influence of the holy prince several apparent foreigners were also baptized. For example, the Norwegian "koenig" (king) Olaf Trueggvason (+ 1000) who lived several years at Kiev, and also the renowned Torvald the Wanderer, founder of a monastery of St John the Forerunner along the Dneipr near Polotsk, among others. In faraway Iceland the poet-skalds called God the "Protector of the Greeks and Russians." In addition to the Christian preaching, there were the renowned feasts of St Vladimir. After Liturgy on Sundays and Church Feasts there were put out abundant feasting tables for the Kievans, they rang the bells, choirs sang praise, the "transported infirm" sang bylini-ballads and spiritual verses. 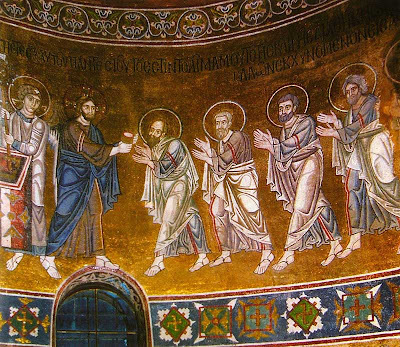 On May 12, 996, for example, on the occasion of the consecration of the Tithe church, the prince "made a bright feast." He distributed goods "to many of the poor, and destitute and wanderers, and through the churches and the monasteries. To the sick and the needy he delivered through the streets casks and barrels of mead, and bread, and meat, and fish, and cheese, desiring that all might come and eat, glorifying God". Feasts were likewise celebrated in honor of the victories of Kievan warriors, and the regiments of Vladimir's retinue: of Dobrynya, Alexander Popovich, Rogda the Bold. 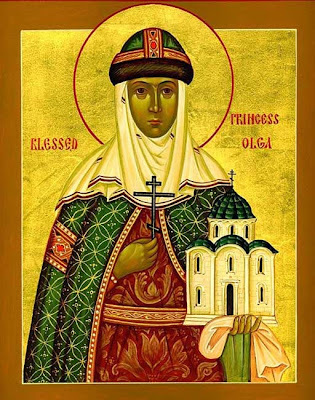 In the year 1007 St Vladimir transferred the relics of St Olga to the Tithe church. Four years later, in 1011, his spouse and companion in many of his undertakings, the Blessed Empress Anna, was also buried there. After her death the prince entered into a new marriage with the young daughter of the German Graf Kuno von Enningen, granddaughter of the emperor Otto the Great. The era of St Vladimir was a crucial period for the formation of Orthodox Rus. The unification of the Slavic lands and the formation of state boundaries under the domain of the Rurikovichi resulted from a strenuous spiritual and political struggle with neighboring tribes and states. The Baptism of Rus by Orthodox Byzantium was a most important step in its self-definition as a state. The chief enemy of Vladimir became Boleslav the Brave, whose plans included the extensive unification of the West Slavic and East Slavic tribes under the aegis of Catholic Poland. This rivalry arose back when Vladimir was still a pagan: "In the year 6489 (981). Volodimir went against the Lakhs and took their cities, Peremyshl, Cherven, and other cities, which be under Rus." The final years of the tenth century are likewise filled with the wars of Vladimir and Boleslav. After a brief lull (the first decade of the eleventh century), the "great stand-off" entered into a new phase: in the year 1013 a conspiracy against St Vladimir was discovered at Kiev. Svyatopolk the Accursed, who was married to a daughter of Boleslav, yearned for power. The instigator of the conspiracy was Boleslav's cleric, the Kolobzheg Catholic bishop Reibern. The conspiracy of Svyatopolk and Reibern was an all-out threat to the historical existence of the Russian state and the Russian Church. St Vladimir took decisive measures. All the three involved were arrested, and Reibern soon died in prison. St Vladimir did not take revenge on those that "opposed and hated" him. Under the pretense of feigned repentance, Svyatopolk was set free. A new misfortune erupted in the North, at Novgorod. Yaroslav, not yet "the Wise," as he was later to be known, in the year 1010 having become ruler of Novgorod, decided to defect from his father the Great Prince of Kiev. He formed his own separate army, moving on Kiev to demand the customary tribute and tithe. The unity of the Russian land, for which St Vladimir had struggled all his life, was threatened with ruin. In both anger and in sorrow St Vladimir gave orders to "secure the dams and set the bridges," and to prepare for a campaign against Novgorod. His powers were on the decline. In the preparations for his final campaign, happily not undertaken, the Baptizer of Rus fell grievously ill and surrendered his soul to the Lord in the village of Spas-Berestov on July 15, 1015. He had ruled the Russian realm for thirty-seven years (978-1015), twenty-eight of these years after his Baptism. Preparing for a new struggle for power and hoping for Polish assistance, and to play for time, Svyatopolk attempted to conceal the death of his father. But patriotically inclined Kievan nobles, by night, secretly removed the body of the deceased sovereign from the Berestov court, where Svyatopolk's people were guarding it, and they conveyed the body to Kiev. At theTithe church the coffin with the relics of St Vladimir was met by Kievan clergy with Metropolitan John at the head of the procession. The holy relics were placed in a marble crypt, set within the St Clement chapel of the Dormition church beside the marble crypt of Empress Anna. The name and deeds of the holy Equal of the Apostles St Vladimir, whom the people called the Splendid Sun, is interwoven with all the successive history of the Russian Church. "Through him we too have come to worship and to know Christ, the True Life," testified St Hilarion. His deeds were continued by his sons, and grandsons and descendants, rulers of the Russian land for almost six centuries, from Yaroslav the Wise, who took the first steps towards the independent existence of the Russian Church, down to the last of the Rurikovichi, Tsar Theodore Ioannovich, under whom (in 1589) the Russian Orthodox Church became the fifth independent Patriarchate in the dyptichs of Orthodox Autocephalous Churches. The festal celebration of the holy Equal of the Apostles Vladimir was established under St Alexander Nevsky, in memory of the intercession of St Vladimir on May 15, 1240, for his help in gaining the renowned victory by Nevsky over Swedish crusaders. Thou wast like a merchant who seeketh a goodly pearl, O glorious Sovereign Vladimir, sitting on the height of the throne of the mother of cities, God-protected Kiev. Searching and sending to the imperial city to know the Orthodox Faith, thou didst find Christ, the priceless Pearl, Who chose thee as a second Paul, and Who did shake off thy spiritual and bodily blindness in the holy font. Wherefore, we who are thy people celebrate thy falling asleep. Pray that thy land of Russia be saved, and that Orthodox people be granted peace and great mercy. Like the great Apostle Paul, O most glorious Vladimir, in thy maturity thou didst forsake all zeal for idols and a childish sophism, and as a full-grown man thou wast adorned with the royal purple of divine Baptism. And now as thou standest in joy in the presence of Christ our Saviour, pray that thy land of Russia be saved, and that Orthodox people be granted peace and great mercy.